As African Swine Fever continues to spread in China, Vietnam, and across much of Eastern Europe and parts of Russia, one of the big concerns is how to prevent its entry into North America. In late 2018 the USDA released a new African Swine Fever Factsheet that discusses their preparations for a possible introduction of the virus into this country. Working with CBP staff at ports of entry to increase passenger and baggage screening for prohibited products from affected countries. Although ASF has never been reported in North America, the potential for seeing it here someday is quite real, and the costs to agricultural interests could run into the billions. Five years ago we saw the arrival of another, less dangerous porcine virus - PEDV - which is believed to have originated from China (see mBio: PEDV - Porcine Epidemic Diarrhea Virus – An Emerging Coronavirus). Last September, in African swine fever (ASF) threatens to spread from China to other Asian countries, the FAO described how easily ASF can cross borders, and even oceans. 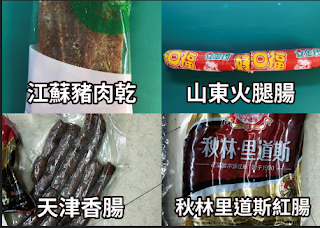 Which is why, for months we've been following reports of dozens of interdictions of illegal (and sometimes ASF positive) pork products carried by travelers from China - and recently Vietnam - into places like Taiwan, Japan, South Korea and Australia. In their most recent report, Taiwan states that 7.5% of the pork products confiscated from travelers this month coming from China have tested positive for the ASF virus gene. On a far grander scale, overnight multiple news agencies are reporting on the raid and seizure by US Customs and Border Protection officers of a record-setting cache of smuggled pork products from China at the Port of Newark, NJ. U.S. federal agents seized 1 million pounds (454 metric tons) of pork smuggled from China to a port in New Jersey amid fears the meat could contain traces of the African swine fever virus that has ravaged the Asian country’s hog herd. In some cases, the packaging matched the product on the manifest, but the contents were prohibited pork. In other instances, the pork was simply packaged among other good, authorities said. So far, we've no word on whether any of these confiscated pork products have tested positive for the ASF gene, but even limited testing on this quantity of products could take some time. While this seizure by Customs officials represents a bullet successfully dodged, history tells us there are undoubtedly many more rounds in the chamber. Over the years we've looked at some of the extreme methods people have used to smuggle food products into the United States, and elsewhere around the world. In 2015's A Quail Of A Tale the U.S. Customs Agency intercepted 26 pounds of raw quail eggs at Boston's Logan Airport in the luggage of a traveler from Vietnam, who declared the items, apparently unaware of the danger they posed. In May of 2013, in All Too Frequent Flyers, we saw a Vietnamese passenger, on a flight into Dulles Airport, who was caught with 20 raw Chinese Silkie Chickens in his luggage. The following month we saw a traveler (see Vienna: 5 Smuggled Birds Now Reported Positive For H5N1) attempt to smuggle 60 live birds into Austria from Bali, only to have 39 die in transit, and five test positive for H5N1. Fortunately, no humans were infected. In 2012, in Taiwan Seizes H5N1 Infected Birds, we learned of a smuggler who was detained at Taoyuan international airport in Taiwan after arriving from Macau with dozens of infected birds. Nine people exposed to these birds were observed for 10 days, and luckily none showed signs of infection. In 2011, in Bushmeat,`Wild Flavor’ & EIDs, we looked at the illegal trade in exotic food, including bats, monkeys, large rats, crocodiles, small antelopes and pangolins. Incredibly, in 2010, two men were indicted for attempting to smuggle dozens of song birds (strapped to their legs inside their pants) into LAX from Vietnam (see Man who smuggled live birds strapped to legs faces 20 years in prison). This is the first report detailing the isolation of H7N9 from raw meat products outside mainland China and suggests that the illegal transport of poultry is a possible cause of the spread of the virus in Asia, the authors wrote. Whether for personal consumption, for profits, or even for purposes of Agro-terrorism - the threats from the illegal importation of illegal food products, agricultural diseases, and/or invasive species are very real - and when successful - could prove disastrous to agricultural interests. The reality is, as ASF continues to spread across Asia and parts of Europe, the opportunities for it to reach North America are only going to increase over time.